Some of the information in this section is taken from Jeremy Taylor's Hosptial And Asylum Architecture in England 1840-1914 . If you want to know more about other hospitals, asylums, buildings and architects, then please refer to his excellent, but difficult to get, book. Before GT Hine's emergence as a specialist asylum architect, the leading role in this area during the 1870s and 1880s had been played by CH Howell, who - like Hine after him - was Consulting Architect to the Commissioners in Lunacy. His completed asylum schemes included Brookwood, Cholsey and Cane Hill, the last developing a radiating pattern for the pavillion blocks. Between 1886 and 1897, Howell was assessor for no less than seven large asylum competitions, and there was some professional disquiet that Giles, Gough & Trollope or GT Hine always seemed to receive the first two premiums - with the result that any new ideas on asylum design were being stultified. 1862-7 Surrey County (2nd) Asylum Brookwood Asylum Brookwood, Woking, Surrey Closed 1994, some demolished, some converted. 1867-70;1877 Berkshire County Asylum Fairmile Asylum Fairmile, Cholsey, Oxfordshire Closed 2003. Derelict. 1868-71 East Riding Asylum Beverly Asylum Broadgate, Beverly, North Yorkshire Totally demolished 1991. 1883;1889-91 Surrey County (3rd) Asylum Cane Hill Asylum Coulsdon, South London Closed 1991. Mostly demolished 2008-9. 1898 Middlesborough Asylum St. Luke's Asylum Middlesbrough, Cleveland Still in use. 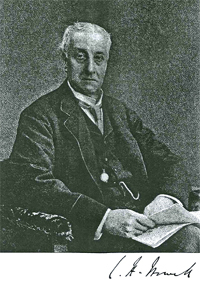 Son of T.C.Hine of Nottingham, with whom he was in partnership up to 1891. In 1887, after winning the competition for the enormous new LCC (London County Council) at Claybury, Essex, he established his practise in London. Hine specialized in asylum architecture, and his paper to the RIBA in 1901 still provides a valuable review of asylum design and planning. This was strengthened by his experience as Consulting Architect to the Commissioners in Lunacy - a post which he held from 1897. He was a frequent entrant for asylum competitions, winning his first, for Nottingham Asylum in 1875. During the 1880s and 1890s he entered ten asylum competitions - winning five - and was assessor for four others. 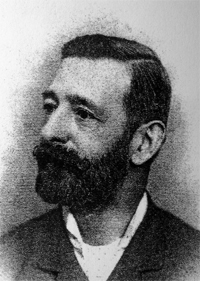 He designed and saw completed four major LCC asylums housing over 2000 patients each (Claybury, Bexley, Horton and Long Grove), and his prolific output included new county asylums for Hertfordshire, Lincolnshire, Surrey, East Sussex and Worcestershire, as well as extensive additions to many others. His concentration on this one building type reflected his own perception of asylum architecture as an "almost distinct profession in itself". 1875-80 Nottingham Borough Asylum Mapperley Asylum Mapperley, Nottingham, Nottinghamshire Closed in the early 1990s. Now housing. 1887-93 Claybury Asylum (5th LCC) Claybury Asylum Claybury, Redbridge, London Converted to Repton Park luxury housing. 1889-90 Nottingham Borough Asylum (Extensions) Mapperley Asylum Mapperley, Nottingham, Nottinghamshire Closed early 1990s. Now housing. 1890 Dorset County (2nd) Asylum (Extensions) Herrison Asylum Herrison, Dorchester, Dorest Converted to housing. 1891-95 Sunderland Borough Asylum Cherry Knowle Asylum Cherry Knowle, Ryhope, Sunderland Derelict. To be demolished. 1893 Middlesex County (3rd) Asylum (Additions) Banstead Asylum Banstead, Banstead, Surrey Totally demolished. 1893 Isle Of Wight County Asylum (Completion) Whitecroft Asylum Whitecroft, Newport, Isle Of Wight Being converted to housing. 1897-02 Lincolnshire County (Kesteven) Asylum Rauceby Asylum Rauceby, Sleaford, Lincolnshire Closed 1997. Being converted to housing. 1898 London County Asylum Bexley Asylum Bexley, Dartford, Kent Demolished. 1898 Berkshire Asylum (Extensions) Fairmile Asylum Fairmile, Cholsey, Oxfordshire Closed 2003. Derelict. 1900 Herts County Asylum Hill End Asylum Hill End, St. Alban's, Hertfordshire Demolished. 1900 Asylum for the Lunatic Poor Purdysburn Hospital Purdysburn, Belfast, Ireland Built on the colony plan for 1500 patients. Still open. 1901 Somerset And Bath County Asylum Mendip Asylum Mendip, Wells, Somerset Converted to housing. 1901-02 Horton Asylum (11th LCC) Horton Asylum Horton Asylum, Epsom, Surrey Some demolished, rest being converted to housing. 1901-03 East Sussex Asylum Hellingly Asylum Hellingly, Hellingly, East Sussex Derelict. 1901-07 Worcestershire County (2nd) Asylum Barnsley Hall Barnsley Hall, Bromsgrove, Birmingham Mostly demolished. 1901-09 Surrey County Asylum Netherne Asylum Netherne, Hooley, Surrey Converted to housing. 1903-07 Long Grove Asylum (10th LCC) Long Grove Asylum Long Grove Hospital, Epsom, Surrey Converted to housing. 1912 Hampshire County (2nd) Asylum Park Prewett Asylum Park Prewett, Sherbourne, Hampshire Some demolished, some being converted. 1912 Gateshead Borough Lunatic Asylum St. Mary's Asylum North Saltwick, Northumberland Derelict. To be demolished. Brief biography of G T Hine (thanks to Chris Carter-Pegg for this information). 1841: George Thomas Hine is born, the eldest son of Thomas Chambers Hine (1813-1899) the renowned Nottingham architect. He is privately educated in England and France. He is a keen rider and rides with the South Nottinghamshire hunt. Later in his life, he becomes a freemason. 1857-9: T. C. Hine designs the Coppice Hospital in Nottingham. It�s during this period that George (1858) joins the firm as a trainee (1858) and began articles with his father. 1864: George spends three years in Australia working on a sheep farm. This is attributed to his speech impediment which causes a serious stammer. Despite trying all manner of �cures�, he suffers from the stammer all his life. 1867: He rejoins his father�s architectural firm as a partner and the firm becomes T.C. Hine and Son. He works on school buildings in Nottingham, large houses and even the castle. 1870: He marries Florence Deane Cooper. 1872: George�s son Thomas Guy Macaulay is born. He will eventually become a physician. 1874: George�s daughter Muriel Florence is born. She is destined to become a novelist. Her novel �A Great Adventure� (1939) is semi-biographical account of her family life. It relates how �George Henty� is almost ruined after investing in a building society which collapses. This could account for the family�s move from a house in Wollaton Village in 1883 to more humble lodgings in Nottingham. 1875-80: T. C. Hine persuades George to enter the competition for the design of the new Nottingham Borough Asylum (Mapperley) . His corridor based design is successful, picked from seven others. 1877: He�s elected as Fellow to the Royal Institute of British Architects (RIBA) after a proposal by the president Charles Barry. 1880: Hallam Carter-Pegg is articled at T.C.Hine and Son in 1880. He helps George with the final work on the Northampton Borough Asylum (Mapperley) asylum. 1883: The Hine family moves from their house in Wollaton Village to more humble lodgings in Standard Hill, Nottinghamshire. It isn�t known for certain why Hine is forced to move but this could�ve been due to losing his investments in a building society. 1883-6: George is a defendant in a court case. Amongst others, he is accused overvaluing the North London Freehold Land and House Company assets. The case collapses when the plaintiff becomes ill and Hine is never called to defend himself. Although this could�ve been extremely damaging to George and his father�s firm, he is able to return to public life. 1887: With the court case finished, and becoming more prosperous, the Hine family move to Simla Villa in Nottingham. 1887: George is amongst six architects invited to design the London County Asylum, Woodford Bridge (Claybury) . He enters an extremely adventurous design, basing it on the new echelon planform, even though it�s reported that the county want another radial pavilion design (along the lines of Cane Hill ). His entry is successful. 1890: Upon the retirement of his father, George and his managing clerk Hallam Carter-Pegg move to London and Hine starts to practice under his own name. 1897: George is made the Consultant Architect to the Commissioners in Lunacy. This frees him from the constraints of having to enter his plans in open competitions and his practice expands as a result. 1898: He�s made an Honorary Member of the Medico-Psychological Association of Great Britain and Ireland. This is given in acknowledgement of his deep commitment to, and understanding of, the methods of treatment of the insane. 1901: He writes a paper on asylum planning to the RIBA but is unable to deliver it due to his stammer. His paper is read out for him. 1910: Hallam Carter-Pegg becomes a partner in the firm which is now renamed G. T. Hine and Pegg. 1916: George Thomas Hine dies. Hallam Carter-Pegg's obituary from The Times (thanks to Chris Carter-Pegg for this information).